Data covering the end of 2009 continue to roll in. This week, we received new information about home prices from two independent sources. First, the celebrated S&P/Case-Shiller index was released on February 23, showing that home prices nationwide were up 1.1 percent in the fourth quarter (seasonally adjusted), following a 3.3 percent decline in the third quarter. Over the past four quarters, the Case-Shiller nationwide index registered a decline of 2.5 percent. While the Case-Shiller index is a good measure of home values nationwide and particularly in the nation’s largest metropolitan areas, its component indices contain no specific information about Arkansas. An alternative is the similarly-constructed set of house price indices produced by the Federal Housing Finance Agency (FHFA). The latest set of estimates from this source was released yesterday (February 25). The FHFA’s purchase-only index (comparable Case-Shiller) showed that house prices nationwide were basically flat in the second half of 2009 (up 0.1 percent in the third quarter and down 0.1 percent in the fourth). For the year, this measure showed house prices down 1.2 percent. 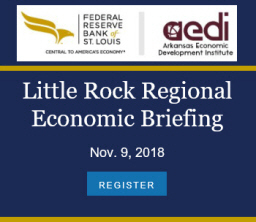 For Arkansas, the FHFA sales only index showed an increase of 0.5 percent in the fourth quarter, and realtive to a year earlier, house prices were up by 1.5 percent. As shown in the chart below, this continues a clear pattern: During the period of rapid price appreciation in the first half of the decade, Arkansas home prices grew more slowly than the nationwide average. Since 2007, price changes in Arkansas have been similarly muted — we haven’t seen the sharp declines that have been evident in other parts of the country. The FHFA also produces an alternative “all-transactions” index that includes appraisals from refinancings in addition to sales-price data. By this measure, house prices have recently shown more weakness, with prices down 1.9 percent in Arkansas and down 4.7 percent nationwide (from 2008Q4 to 2009Q4). 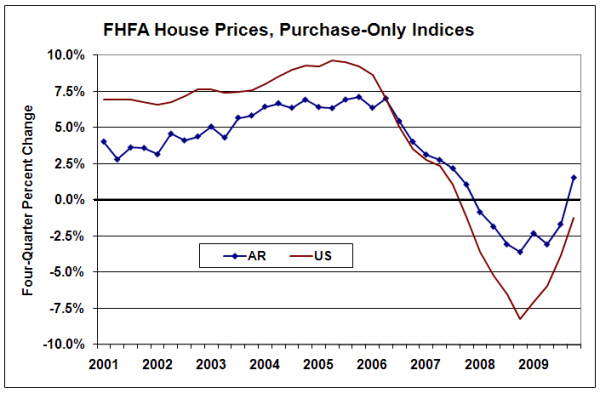 Note that Arkansas home prices have remained more stable than those in the rest of the country, using either measure. Whether the purchase-only or all-transactions index is a better measure of home values in general is an open question. [See Comment: Differences Among Home-Price Indices] But by adding data observations from refinancing appraisals, the FHFA is able to construct indexes for smaller geographic areas, including all of the nations Metropolitan Statistical Areas (MSAs). The table below shows how home prices in Arkansas’ MSAs fared during 2009, in comparison to recent years. Home prices fell in most of Arkansas MSAs in 2009, but the declines were generally smaller than the U.S. average. The only exception was in the Northwest Arkansas, where prices have followed a pattern similar to the nationwide average over the past few years. Home prices were also down sharply in Hot Springs in 2009, but that figure represents the first annual decline after a series of fairly large increases. Falling house prices in Little Rock and Pine Bluff also represented the first annual declines in the past five years. Jonesboro and Texarkana both experienced modest house-price increases in 2009, and the data show continued strong appreciation in Fort Smith. In some metro areas around the country–including many of those included in the Case-Shiller index–home prices have fallen sharply over the past two to three years following a period of exorbitant price increases. The FHFA data show considerably more stability in Arkansas, with price declines in 2009 representing only a modest departure from the trend of steady appreciation over time. Both the S&P/Case-Shiller and FHFA home price indices are repeat-transactions measures. That is, they track changes in price over time for specific properties. When a house is sold, the sale price is matched to the previous sale price on the same property, creating a “sale pair.” The differences in the sale pairs are aggregated across geographic regions to produce an overall index of prices. The main difference between the two sets of home-price indices is their underlying data sources. The S&P/Case-Shiller indices are constructed using official property records filed with local recorders’ offices. The FHFA, being the regulator for FannieMae and FreddieMac, has access to the voluminous mortgage records held by those to financing agencies. One limitation of using the FHFA data is that the mortgage portfolios of Fannie and Freddie include only “conforming” mortgages, so that higher-priced houses are underrepresented in the sample. The S&P/Case-Shiller data include only transactions when property ownership changes hands, while the FHFA data include all new mortgages, even refinancings. Consequently, the FHFA constructs two seperate sets of indices. The all-transactions indices include these refinincings, where the value is based on appraisals rather than sales prices. In order to more closely mirror the Case-Shiller index, the FHFA also publishes a set of purchase-only estimates. There are both pros and cons to using the refinancing information. The greatest advantage is the increase in data observations that it facilitates. By including these additional observations, it becomes possible to generate reliable estimates for smaller geographic areas, hence the more comprehensive reporting of the FHFA MSA estimates. On the other hand, it is always possible that appraisals will sometimes be out of line with underlying price trends. Although it is unlikely that a systematic bias would emerge over long periods of time, this might be a factor over shorter time periods. One source of bias in appraisal data might even be a benefit for the FHFA data accuracy: Owners of higher-priced homes might be more likely to refinance (to extract equity, for example), so that the inclusion of assessment data might offset the underrepresentation of higher price homes that has been noted in the FHFA data. S&P/Case-Shiller Home Price Indices Methodology (2009). Calhoun, Charles. “OFHEO House Price Indexes: HPI Technical Description,” (1996). Office of Federal Housing Enterprise Oversight. “Revisiting the Differences between the OFHEO and S&P/Case-Shiller House Price Indexes: New Explanations,” (January 2008).